Very old preserving books always include candied angelica, and I wanted to continue this tradition in The Joy of Jams, Jellies, and Other Sweet Preserves. I ended up leaving out this herb, though, because I’d never managed to grow it. In fact, I didn’t even know what it tasted like. But last year, luckily, I found a start at Nichols (a local seed company in Albany, Oregon, and one of my favorites), and the plant has happily sprung back despite the extreme cold of December. 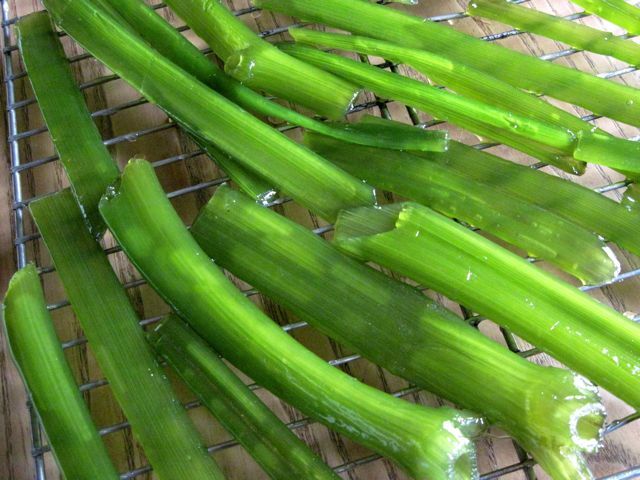 So over the past week, for the first time, I have candied angelica. Angelica is a member of the genus Umbelliferae, which provides an awesome assortment of flavors for the kitchen. Other family members include parsley, carrot, parsnip, fennel, anise, coriander, celery, dill, cumin, lovage, and caraway. Angelica archangelica, the European variety traditionally used in cooking, can grow as tall as eight feet. Tasting the bitter leaves might make you avoid this plant as potentially poisonous, and in fact, the herb has been used more as medicine than as food. The leaves, seeds, stems, and roots of angelica species have all served as remedies for various complaints, especially digestive and bronchial problems. In the kitchen, the leaves have been used for tea, the roots and seeds have flavored wine and liqueurs, the ground dried root has been added to baked goods, and the fresh leaves have flavored salads, soups, stews, custards, ice cream, and other desserts. 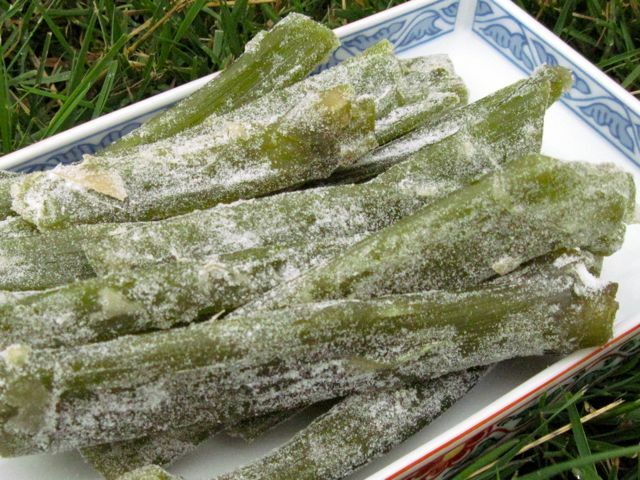 The U.S. Food and Drug Administration considers angelica safe for use as food. 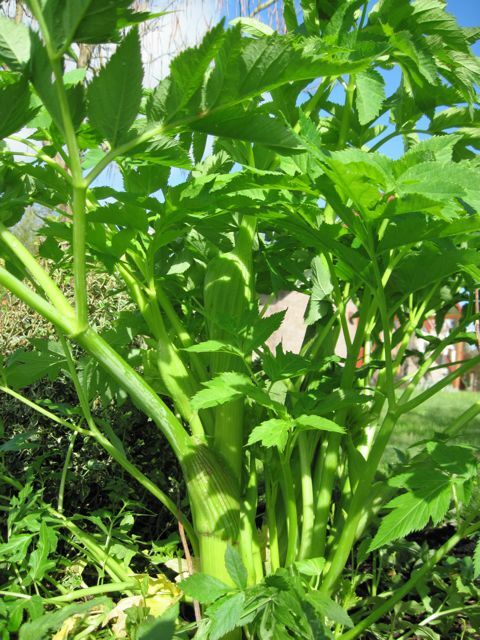 Many old recipes specify that angelica should be cut in April for candying. Early May should be fine, too, provided the stems are still green, not purplish (although you shouldn’t wait until the plant blooms, which according to European tradition happens on May 8, the feast day of St. Michael the Archangel). Use only thick stems, and cut away the leaves and leaf stems. I developed my candying method from several old, slow recipes, although quicker methods might work as well. Click over to the recipe to find out what I did.